Take care of adorable pets and animals, and become a real vet! 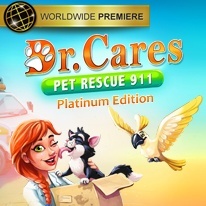 In Dr. Cares - Pet Rescue 911 Platinum Edition, you'll get the chance to become a real vet. How does taking care of adorable animals across 60 story levels and 30 challenge levels sound? As you explore 6 fluffy chapters, you'll perform special treatments, and can even upgrade your clinic! ...But who is this Dr. Cares? Let's introduce you!